Engravers needed now! - We are asked quite often about engraving or imprinting services. If you have engraving experience and capabilities, please contact us with your details. M. C. Naylor Company - Specializing in the personalizing of gifts and promotional items. We use a CO2 laser to engrave knife handles and blades. When engraving stainless steel the laser leaves a durable black image. In business since 2007. Metal Markers - Metal Markers is a custom laser engraving business specializing in metals. Our engraving leaves a high contrast black ceramic mark that is fused to the metal. This process is used in the industrial and the medical fields. Logos and special text are no problem for our process. *AJH* Custom Knives & Services - Profesional knife repairs and refurbishing, sharpening. If it can be fixed, this is the place. One of a kind custom hand made working and collectible knives. Daggers/letter openers, rare 10 Bowie knives, and more. Griffin Custom Knives - The official website for full-time professional custom knife maker, Rendon Griffin. Specializing in custom hand-made automatic and lock-back folding knives. 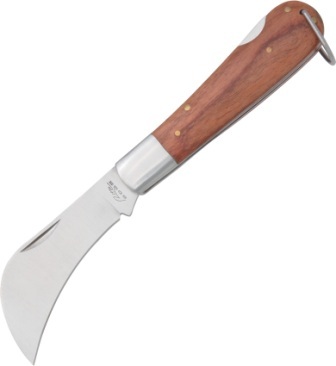 View detailed images of automatic and classic folding knife designs at this site. Rexroat Knives - My strongest points as a knife maker include the large variety of knife styles that I make, the clean lines, and the excellent fit and finish. Sunrise River Custom Knives and Handmade Cutlery - Custom handmade folders and pocket knives. handcrafted hunting, skinning, fish fillet, camping, Bowie knives and tomahawks. Knife repair, restoration and handle conversions. Wild Boar hunting spears and knives. Custom made leather knife sheaths. Built one at a time to be strong and functional, and with reasonable care will last a lifetime. This web site will acquaint you with the many varieties of blades. Classic Knife Kits and Supplies - Build your own knives with this amazing selection of folding knife kits, fixed blade kits, and knife making parts. Precision Products - carries the products that people need and want. We stock all kinds of specialty tools that are fast selling to the public. Satisfaction is always guaranteed! Sarasota Knife Collectors Club - A helpful list of knife clubs, associations, magazines, forums, and knife makers guilds. KnifeSharpeningTips.com - This is a helpful resource if you want to learn more about sharpening your knives and blades. Determine the angle you want for finished edge. From 5 - 10 degrees is normal for knives. The more acute the angle and the thinner the edge, the sharper the blade will be. However, a thin edge is less durable than a thicker edge, and you should select the angle according to the use intended for the knife. If in doubt, use 7 - 8 degrees, the angles usually set by better knife manufacturers. Place the knife and the sharpener together at the angle you've chosen, and maintain approximately that angle throughout the sharpening process. If you don't stay close to the angle, sharpening will take longer, and the edge probably will not be completely satisfactory. Click here to read more. Cutlers Cove Knife Emporium - Since 1991, specialist in vintage pocket knives, folders and fixed blades. Cutlery Resources - Cutlery resource Website Provided by Discount Cutlery. Knife Information - The Knife Information Website. Knife Web Guide - Your gateway to knife, sword, and cutlery information. The Carver's Companion - A helpful list of links associated with wood carving. Supplies, tools, patterns, books and more. The Knife Network - With over 1000 pages of knife industry data and images, 500 networked knife industry sites, knife makers, factory knife companies and knife enthusiasts from around the world stay on top of the production and custom knife industry. Read field test reviews and meet the knife industry players online.